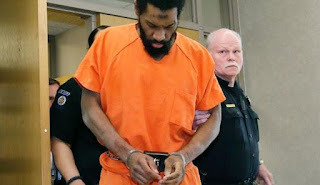 There is a religion that says, “When you meet the unbelievers, strike necks” (Qur’an 47:4) and it might, just might, have something to do with Alton Nolen, but neither Oklahoma attorneys nor the entire political and media establishment want you to realize that. An Oklahoma man was convicted Friday of first-degree murder in the 2014 beheading of his co-worker at a food processing plant. The jury also convicted Nolen of assault and battery with a deadly weapon for attempting to behead a second co-worker at the Vaughan Foods plant in Moore, a suburb of Oklahoma City. Prosecutors have said they would seek the death penalty. Investigators said Nolen had just been suspended from his job when he walked into the company’s administrative office and attacked Hufford. Authorities said Nolen stabbed another co-worker, who survived, before he was shot by a company executive. Defense attorneys argued that Nolen is mentally ill and didn’t know his actions were wrong, with one attorney saying that their client had created his own religion in his mind that “doesn’t make sense to anyone else.” But prosecutors said Nolen knew right from wrong before he attacked Hufford.